After the 1939 film "Stagecoach," starring John Wayne, westerns got big budgets and top stars. The western is back. With Brad Pitt starring in "The Assassination of Jesse James by the Coward Robert Ford," a Venice Film Festival best actor award notched on his six-shooter, it's easy to believe that the buzz may be true. Andrew Dominik's film, although suffering a troubled post-production history, still boasts a dream cast that also includes Casey Affleck, Sam Shepard, and Mary-Louise Parker, and a wonderful pedigree. Dominik based his screenplay on Ron Hansen's brilliant novel on the price of celebrity and the wages of loyalty. The film explores just how easily they morph into obsession and paranoia. "Jesse James" will be in release alongside James Mangold's superbly directed "3:10 to Yuma," which opened to critical raves and strong box office four weeks ago. This updated version of the Elmore Leonard short story (sold to Dime Westerns in 1953 for $90) was made into a fine little film back in 1957 by Delmer Daves, starring Glenn Ford as the outlaw and Van Heflin as the reluctant deputy who must get him to that train on time. In a classy piece of crediting, Lionsgate gives original screenwriter Halsted Welles equal billing with the new team of Michael Brandt and Derek Haas, but the new film is far superior to the stagebound original in every respect from the leads - Russell Crowe and Christian Bale - to the supporting cast of Peter Fonda, Logan Loerman, Gretchen Mol, and, in the most delightfully psychotic performance of the year, Ben Foster. The movie buff must go back more than 40 years to find a time when two of Hollywood's top stars competed in westerns. Back to when John Wayne, Marlon Brando, Joel McCrea, James Stewart, Kirk Douglas, Burt Lancaster, Paul Newman, Henry Fonda, Robert Mitchum, and Gregory Peck all regularly appeared in westerns (at a time when Clint Eastwood still portrayed Rowdy Yates on the CBS TV series "Rawhide"). Of course, back then the western represented a third of all theatrical films produced, while more than 40 western series played weekly on television. This new Wild West boomlet has also been vividly displayed on television where, building on the critical success of HBO's "Deadwood," two western long-form dramas dominated the Emmys. Walter Hill's "Broken Trail," from Alan Geoffrion's script, scored astonishing ratings for AMC while garnering 16 Emmy nominations. Stars Robert Duvall and Thomas Haden Church both won, as did the show for best miniseries. HBO's adaptation of Dee Brown's 1969 bestseller "Bury My Heart at Wounded Knee" received 17 nominations, winning for best made-for-TV-movie, as well as in five technical categories. Add to this mix Chris Cain's recently released "September Dawn," the horrendous tale of an 1857 wagon-train massacre in Utah, the highly anticipated November release of the Coen brothers' adaptation of Cormac McCarthy's contemporary western, "No Country for Old Men," and the CBS miniseries "Comanche Moon," a prequel to "Lonesome Dove," scripted by Larry McMurtry and Diana Ossana (fresh off their Oscar win for "Brokeback Mountain"). Even the most skeptical observer must admit that the horse opera seems firmly back in the saddle again. The resurrection of this uniquely American art form is something of a cyclical affair. The first film to tell a complete story was, of course, a western, Edwin Porter's "The Great Train Robbery" (1903). 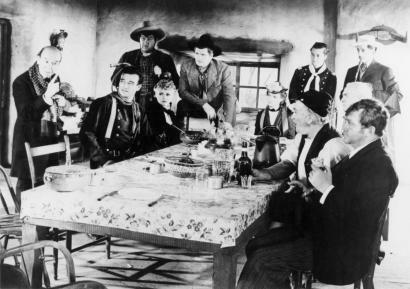 The western quickly emerged as a staple of the new film industry in the teens and '20s, with John Ford's "The Iron Horse" ranking as the top-grossing film of 1924 with an astonishing $4 million at the box office. But despite Warner Baxter winning the 1929 Oscar for his portrayal of the Cisco Kid in the first sound western, "In Old Arizona," and "Cimarron" winning for Best Picture in 1931, the western fell on hard times throughout the 1930s. The major studios avoided the genre while independent production companies flooded screens with kiddie serials, Tom Mix showmanship, action froth, and singing cowboys. No one took the western seriously until Ford's "Stagecoach" (1939) led to a major revival. Westerns now suddenly attracted big budgets and top stars, soon accounting for a third of all film production over the next quarter century. Then came a slow death, as the genre languished amid spaghetti western nihilism, the deaths of major directors and stars, changing tastes, and a deeply cynical national mood swing during the Vietnam Era. After being relegated to celluloid Boot Hill by film critics, westerns gained a new lease on life with Chris Cain's "Young Guns" (1988), helped along considerably by Simon Wincer's "Lonesome Dove" on television (1989), and quickly followed by Kevin Costner's 1990 Academy Award triumph (seven Oscars, including Best Picture) "Dances With Wolves." Two years later Clint Eastwood's "Unforgiven" won four Academy Awards, becoming only the third western to capture the Best Picture Oscar. Despite the commercial success of "The Last of the Mohicans" (1992), "Tombstone" (1993), and "The Mask of Zorro" (1998), the western was yet again pronounced dead. The efforts by some of Hollywood's top talent - Walter Hill's "Geronimo" (1993), Lawrence Kasdan's "Wyatt Earp" (1994), Ang Lee's "Ride with the Devil" (1999), Ron Howard's "The Missing" (2003), John Lee Hancock's "The Alamo" (2004) - all failed to resurrect the genre. The critical success of Lee's "Brokeback Mountain" (2005) was not usually attributed to its western content, despite the fact that it was just as much a contemporary western story as "Lonely Are the Brave" (1962), "Hud" (1963), "The Last Picture Show" (1971), or "Lone Star" (1996). While it's obvious that the western never died, it has undoubtedly been comatose more than a few times over the last century. Cable television has given a new lease on life to the genre, both in terms of new productions as well as by making older titles accessible to new audiences. It's not difficult to find the original "3:10 to Yuma" on the Westerns Channel or to catch Tyrone Power as "Jesse James" on Turner Classic Movies. TNT scored solid ratings in 2005 by partnering with Dreamworks on the miniseries "Into the West," and HBO and AMC both enjoyed similar success last season with their western dramas. The western is alive and well, although its demographics trend toward an older, male audience and away from urban centers. Bankable stars like Pitt and Crowe help with the gender balance, while strong action, even if the weapons are not automatic, appeals to younger audiences. If a pirate movie and a comic-book sword-and-sandal epic can score among the Top 10 worldwide box office hits in 2007, then there is certainly hope for the western. The key to success is, of course, the story. The western past, so clearly identified with American exceptionalism, provides countless stories. The Western hero - whether wearing Davy Crockett's coonskin cap, the Cisco Kid's sombrero, or the Ringo Kid's Stetson - is so essentially American that he can never die. Paul Andrew Hutton, distinguished professor of history at the University of New Mexico and executive director of the Western Writers Association, writes documentaries for the History Channel.